The edible red seaweed Kappaphycus alvarezii or Eucheuma cottonii is commercially cultivated in the pristine tropical seas for carrageenan production. The systemic, cellular, and molecular effects of E. cottonii 50% alcohol extract [seaweed E. cottonii ethanol extract (SECE)] on breast cancer were investigated in a rat model. 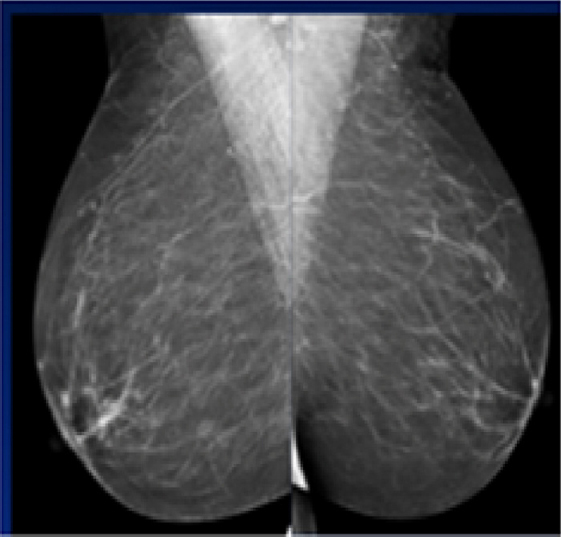 Mammary tumor was induced by subcutaneously injecting LA7 cells in female rat mammary pads. After 2 weeks of cancer growth, the rats received oral administration of either SECE [150 mg/kg body weight (BW) and 300 mg/kg BW] or tamoxifen. Electron microscopy imaging results confirmed macrophage activity and hematoxylin and eosin staining indicated that tumor histopathological alterations were restored toward normal structures by the seaweed extract. The extract suppressed tumor development and modulated the immune responses. This was evidenced by the microscopic observations, the increased spleen weight, size, spleen CD19 B cells, and blood immunoglobulin G (IgG) levels. The extract also increased the circulating total white blood cells, lymphocytes, segmented neutrophils count, T cells (CD3), T-helper cells (CD4), cytotoxic T cell (CD8), and nuclear factor-kappa beta expressions. The extract enhanced cancer cell death, by upregulating the Birc5, Chk1, and p53 levels and downregulating the tumor growth cellular Mdm2 (transformed mouse 3T3 cell double minute 2) messenger RNA (mRNA) expression. The extract showed no toxicity at 150 mg/kg BW in rats. The lectin-rich SECE showed tumor suppression by enhancing immune responses and upregulating the cancer cell apoptosis mRNA expressions. Cutaneous melanin pigment plays a critical role in camouflage, mimicry, social communication, and protection against harmful effects of solar radiation. It has been proven that tyrosinase plays a pivotal role in melanocytes dendrite formation; however, the molecular mechanism underlying this process has not been fully elucidated. The morphological changes were observed under a phase contrast microscope. These changes were evident, with globular cell bodies and increased numbers of tree branch-like dendrites. The present work aimed to study the morphoanatomic effects of purified tyrosinase to determine its skin-darkening potential using B16F10 melanocyte, which has not been done to date. Phase contrast and immunofluorescence microscopic analysis of B16F10 melanocytes has been done after treatment with various concentrations of purified tyrosinase along with standard tyrosinase (Sigma) in order to explore the mechanism of action of purified tyrosinase induced skin darkening. The phase contrast microscopic results showed that the number of melanocytes with melanin-loaded dendrites has increased significantly in purified tyrosinase treated cells in a dose dependent manner leading to skin darkening. In addition, immunofluorescence microscopic analysis revealed purified tyrosinase increase cellular tyrosinase expression in doze dependent manner due to tyrosinase absorption in B16F10 melanocyte. Present findings proved that purified tyrosinase possesses a skin darkening potential and could be used as a safe melanogenic agent for the treatment of hypopigmentation disorders or vitiligo. Overlapping morphological characteristics pose some difficulties in making a proper diagnosis of clear cell renal cell carcinoma (CCRCC), chromophobe renal cell carcinoma (ChRCC), and oncocytoma, on the basis of hematoxylin–eosin-stained tissue sections. Our objective was to find out a fast, reliable panel of immunohistochemical markers for differentiation between them. The study was carried out on 55 selected renal tumor specimens: 36 cases of CCRCC, seven cases of ChRCC, and 12 cases of oncocytoma. The specimens were stained immunohistochemically for vimentin, CD117, cytokeratin (CK)7, and caveolin (Cav)-1. Sensitivity and specificity for each marker were calculated. Vimentin expression was exclusively observed in CCRCC (100%) and negative in ChRCC and oncocytoma. CD117 was absent in CCRCC, but it was strongly expressed in ChRCC (85.5%) and oncocytoma (91.7%), with high sensitivity and specificity. Most CCRCCs and oncocytomas were negative for CK7 (91.7% and 83.3%, respectively), in contrast to ChRCCs, which showed positivity in nearly 86% of the cases. Good sensitivity and specificity were calculated for CK7 in differentiating studied oncocytic tumors. Cav-1 was positive in ~78% of the CCRCCs and in all ChRCCs, whereas the vast majority of oncocytomas were negative. So the immunoprofile of CCRCC was vimentin+/CD117−/CK7−/Cav-1±, ChRCC was vimentin−/CD117+/CK7+/Cav-1+, and oncocytoma was vimentin−/CD117+/CK7±/Cav-1−. So, by using combination of four markers (vimentin, CD117, CK7, and Cav-1), we achieved excellent sensitivity and specificity for differential diagnosis of CCRCC, ChRCC and oncocytoma. 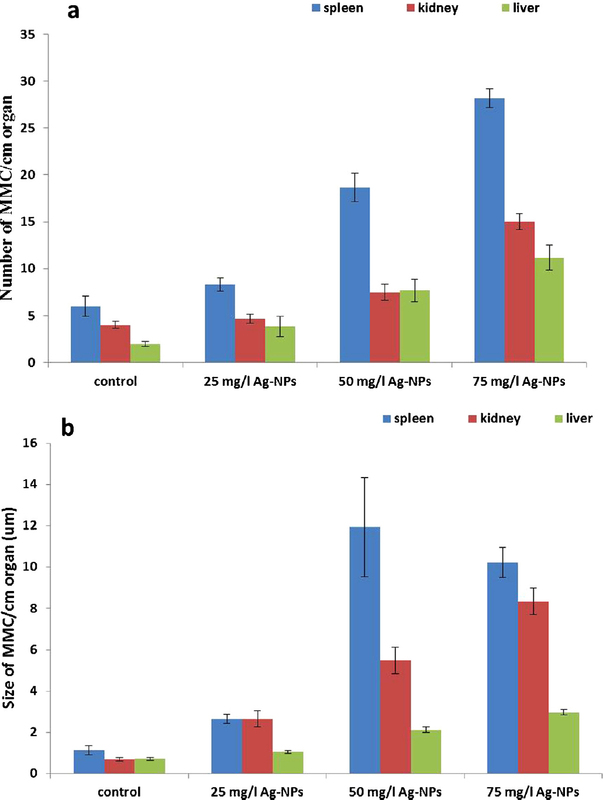 Although there are many applications of silver nanoparticles (Ag-NPs) in human activities, there is still little known about their potential environmental toxicity, particularly to fish. In the present study, the effects of Ag-NPs on African catfish (Clarias gariepinus) were studied using melanomacrophage centers as immunohistological biomarkers. Fish were exposed to 25 mg/L, 50 mg/L and 75 mg/L 100-nm Ag-NPs. We studied the effects on the size and number of melanomacrophage centers in all target tissues. Many histopathological alterations in those tissues were observed. 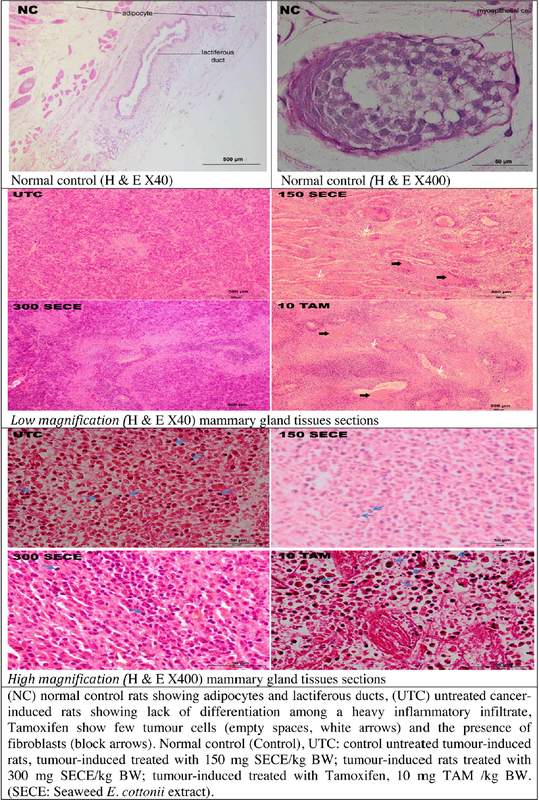 The histological changes were represented as dislocation of the epithelium, dilatation of central veins associated with inflammatory leukocytic infiltration, necrosis, and pyknotic nuclei of hepatocytes. There was shrinkage of Malpighian corpuscles, dislocation of nuclei of convoluted tubules, cellular degeneration, and dispersed infiltration of leukocytes in kidney tissue. Examination of spleen sections after exposure to Ag-NPs showed rupture within the red pulp and hemorrhage, dislocation of nuclei, accumulation of inflammatory leukocytes, and congestion in blood vessels. In conclusion, exposure to Ag-NPs induced alterations in tissues, suggesting a possible increase in oxidative stress in those tissues. The oviductal and uterine epithelial cells have a crucial role, but are still poorly understood. Numerous studies have tried to isolate the epithelial cells from different organs in various models. 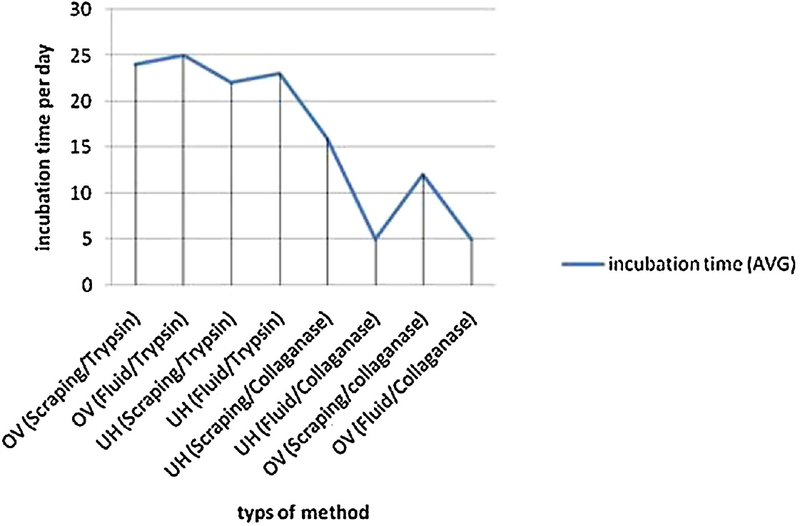 The current study aimed to establish and characterize an in vitro monolayer culture of the oviduct and uterine horn epithelial cells by using two different techniques. Female reproductive epithelial cells from sows were cultured in follicular phase. Combined protocols to isolate the epithelial cells were performed. The viability and cell number were determined. Monolayers of epithelial cells from each group were cultured in four-well plates and were subjected to immunostaining using a Vector ABC Elite Kit. The immunohistochemical staining step was performed to evaluate the quality of the epithelial cells. Oviductal cells reached confluence faster than uterine horn cells. Cilia were seen in oviduct and uterine horn tissue culture. All the isolated cells reached confluence prior to harvesting. The number of cells was increased over the time of incubation. 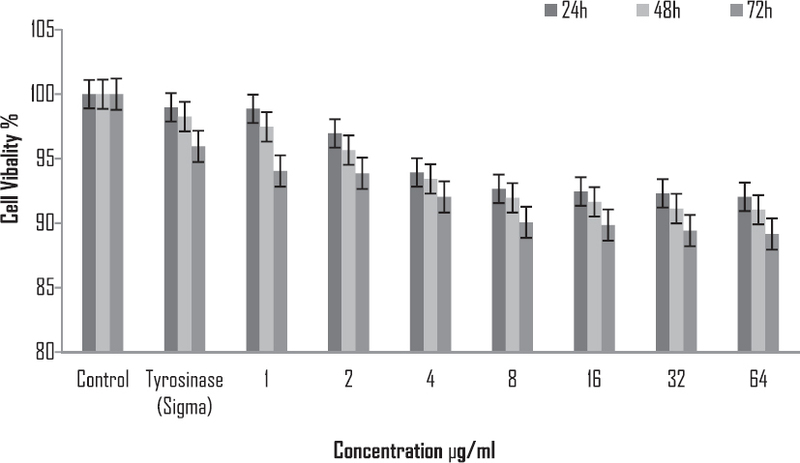 Monolayer culture using the trypsin/EDTA method took longer than culture with the collagenase method. Immunohistochemistry of epithelial cells showed strong staining for cytokeratin. Oviductal and uterus epithelial cells were cultured and established. Both techniques used in this experiment were useful and showed no significant differences. This cell culture model has the potential to study the secretory interactions of the female reproductive tract with spermatozoa, oocytesor embryos. The structure of accessory glands (AGs) in the male sesarmid crab, Parasesarma plicatum, is described by light and transmission electron microscopy. Adult males of carapace of width 1.6–2.2 cm were collected from along the estuarine regions of Kanyakumari District, India. Posteriorly, the male reproductive system receives several sac-like structures, referred to as AGs. Histologically, the AG is internally lined by cuboidal epithelium and the lumen encloses eosinophilic vesicular secretions, apparently glycopreoteinaceous in nature. Ultrastructurally, the epithelium shows the signs of typical infrastructure for synthetic activity, as demonstrated by the prolific presence of rough endoplasmic reticulum, free ribosomes, and Golgi complex. The cytoplasm is manifested with electron-dense, electron-lucent, and medium-density secretory vesicles, and the mode of release into the lumen is both merocrine and apocrine. 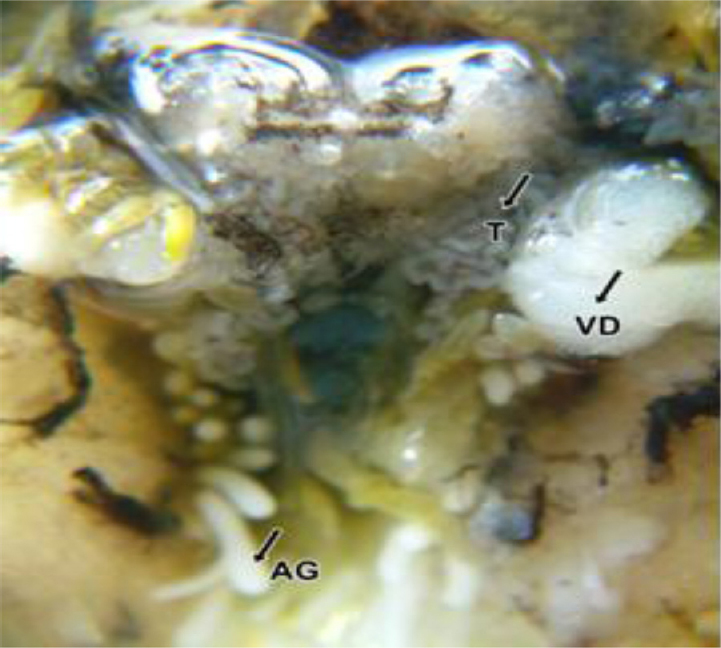 Within the lumen, these secretory vesicles coalesce and aggregate into large heterogeneous masses of varying sizes, which may play an important role post-copulation within the female duct.